When I was a child you couldn’t pay me enough to eat an onion in any way, shape or form, and when I did have to work with them they always made me cry! As an adult, I’ve come to appreciate the value of the onion, not only for the flavor it adds to whatever I’m cooking or preparing, but also for the health benefits it provides. 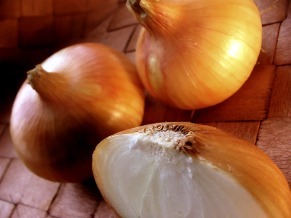 So bring on the onions to help add some sweetness and zip to your meals as well as your health! Onions are a superfood and have lots of health benefits such as cardiovascular benefits, bone health, anti-inflammatory benefits and cancer reduction qualities. It matters what type of onion you use when cooking…check out “Yes, It Matters What Kind of Onion You Use” for more information. Below you will find a chart your students can use with this site in the classroom. The history, harvesting, processing/manufacturing, and storing of onions….view here on an “How it’s Made“. If you soak an onion in a cold water bath for 15-30 before cutting with a sharp knife or cut an onion by a flame you can reduce crying when cutting. How to cut an onion? Watch Alton Brown’s clip to find out how. There a lots of great, easy recipes that you can prepare at home or with your students. You will find some below.